What Would William Morris Think? Whatever would William Morris think? How would he feel seeing how this clever sidewall takes his beloved wallpaper design (the first he ever created) and stylizes it into a series of dots? Whether it brings to mind the Ben Day dots used in comic books or an LED display, the result seems to have been produced using some kind of modern industrial process. Thus, one could imagine that Morris, whose central philosophy involved rejection of all forms of industrial production in favor of handcraft techniques, would be upset to see his beloved pattern reproduced in this way. However, Morris, the great lover of craft, may still find something to enjoy in this take on his work because it is, despite its appearance, completely handmade. A closer look will reveal that every dot is irregularly-shaped and spaced apart, indicating that someone had painstakingly painted the whole thing. The paper’s distinct style, evoking modern industrial technology, both disguises and is a result of its particular method of production, a fact which no doubt would leave a lot of design reformers of the late 19th-century confused. The paper’s handmade production and use of a classic Arts and Crafts movement pattern is not only tongue-in-cheek but ironically serves to remind us how far the world of design had moved on from the ideals of Morris. A paper like this, playfully toying with the work of one of the great figures in the history of design, is such a perfect example of Postmodernist design that it’s no surprise that two great figures of the movement was involved in its creation. Harry Moore was a prolific architect most famous for the Piazza d’Italia in New Orleans. Alan Buchsbaum was an architect and interior designer known for being a pioneer of the Supergraphics and High Tech styles. In his interiors for various New York lofts and stores, he pioneered a type of informal, high-design interior style that used pop culture imagery, off-the-shelf objects, and industrial fixtures. For Norton Blumenthal, a New York-based wallpaper company known for selling reproductions of Victorian embossed papers, Buchsbaum contributed several designs. Some like, Chopped Herringbone, reflect his use of Supergraphics, while Trellis Dot shows him, Moore, and another designer Mark Simon making their own Pop ribbing of a cultural icon. 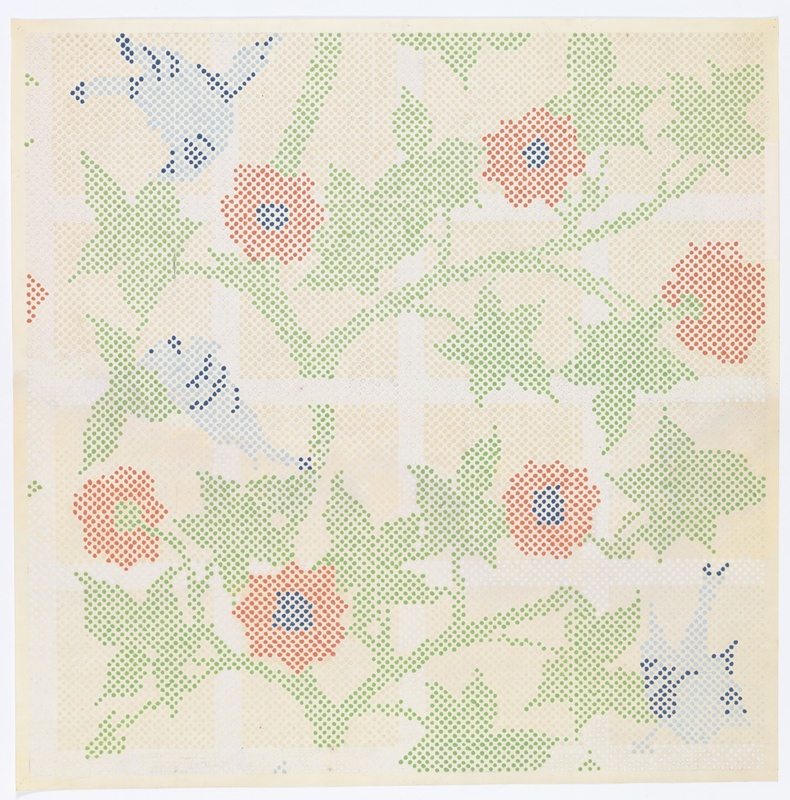 It is not often one can describe a wallpaper pattern as clever and humorous, but Trellis Dot is certainly such a pattern and among the Cooper Hewitt’s best examples of late 20th-century wallpaper design. Giovanni, Joseph. “Alan Buchsbaum, High-Tech Architect, Dies.” The New York Times, April 11, 1987. “New Styles of Anaglypta and Lincrusta.” Old-House Journal, March 1986.